The amazing history of the Saint Bernard dog with photos of the Saint Bernards from The Summit Lodge in Killington, Vermont. The Saint Bernards above lived at Vermont’s Summit Lodge overlooking the mountains of Killington. The Summit keeps two Saint Bernards “on staff” to greet visitors and welcome guests to this fabulous, four season mountain resort. Ask us about Vermont dog-friendly lodging or share your comments. To feature your Vermont pet friendly lodging, contact us. 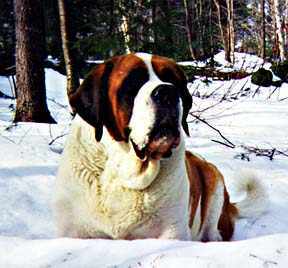 The origin of the Saint Bernard Dog is tied to the mountain pass and the monastery of the same name. The Great Saint Bernard Pass, provides a route between Switzerland and Italy. In 57 B.C., during the Gallic wars, Caesar attempted to conquer the alpine tribes and assure safe passage over the Alps. However, it was not until 7 to 6 B.C. that the Roman legions, under Augustus, conquered the alpine region and secured the pass. The “Tropaeum Alpinum” in La Turbie, stands as monument to past victories by Roman legions and lists the Alpine tribes, whom they defeated. After the Teutonic incursion (starting around the year 500), the pass lost it’s importance and was used less and less during the following centuries. Roads leading toward the pass became desolate. The pass regained its importance during medieval times, but was plagued by brigands and robbers who preyed on travelers. Legend states that the Monastery was founded around the year 950, by the Holy Saint Bernard of Menthon (canonized in 1124 and deacon in Aosta). However, historical fact confirms a meeting between Bernard and the emperor Henry IV in the year 1081, while both men were in Pavia. According to Donnet, St. Bernard contracted a ‘fever’ shortly after the meeting and died in Navarra on May 29, 1081. Thus, it is unlikely that Bernard founded the Monastery 130 years before the date of his death. It is believed that the Monastery was actually founded in or around the year 1050. The evil spirits that Bernard supposedly defeated, were most probably the bands of robbers who frequented the pass. Once founded, the Monastery required a reliable income in order to fulfill it’s duties. A complete list of all donations to the monastery commenced in 1125. In 1177, a Papal Bull from Pope Alexander III placed the Monastery under papal shelter. At that time, the Monastery’s assets enumerated around 80 estates from Sicily, France, Switzerland and England. The pass over Mont-Joux, as the pass was then called, regained its prior importance for commercial travelers and pilgrims to Rome. During the next four hundred years the Monastery grew to about it’s current size. It was in the sixteenth century that the pass and the Monastery were given the name of the Saint Bernard. 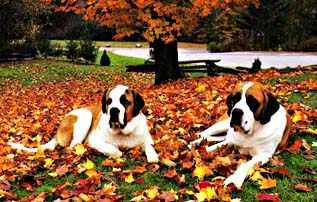 The history of the Saint Bernard Dog, is predicated on access to the Monastery. The pass was deserted for centuries, thus preventing the routine shipment of animals to regions surrounding the pass. From the Roman age to the time during which the Monastery was founded, there was not a steady influx of dogs. The interruption of the shipment of dogs to the area is important to understanding the origin of the Saint Bernard. – special thanks to Dr. Marc Nussbaumer, Natural History Museum of Berne, Switzerland for information and research available in detail at the Naturhistorische Museum Saint Bernard photographs courtesy of the Summit Lodge – Killington’s Classic Four Season Resort in Killington, Vermont.